Who hasn’t woken at least once with a stiff and sore neck? 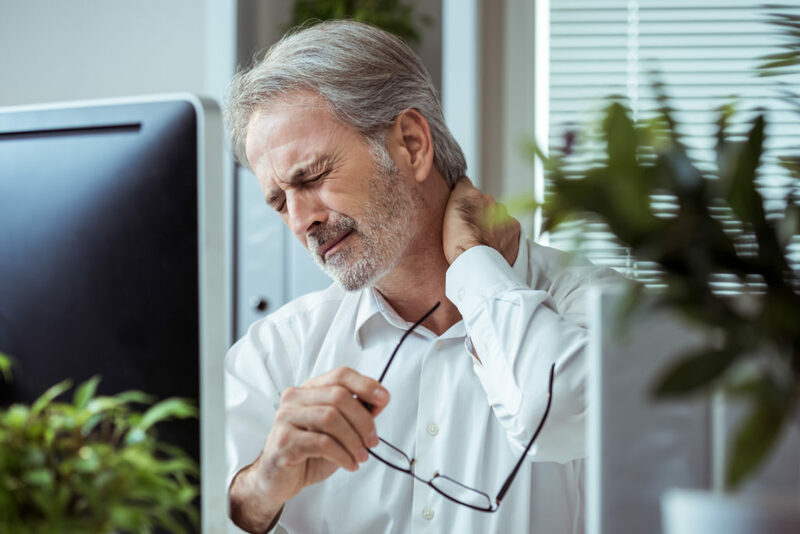 Besides degenerative or autoimmune conditions, pain in your neck can also be the result of bad habits, some of which may be surprising to you. Breaking these habits can be difficult, but are necessary, especially if they lead to chronic and debilitating pain. If you’re experiencing neck pain, pay close attention to these bad habits and see if these fixes can help. Many of us have a sedentary lifestyle, meaning we spend most of our days sitting. Whether it’s in front of a computer or the TV, you can likely be sitting in a way that does not support your body well. Bad posture can make your spine bend out of its natural position. In many cases, this can result in disc pain, sciatica and other problems that stem from the neck down. Whether you’re sitting or standing, always keep your back straight, your head straight and your shoulders down. Don’t cross your feet too much. Try to keep them slightly apart, with your legs bent at a 90-degree angle. Don’t look down at your computer; keep the monitor at eye level to avoid straining. At least once an hour get up and stretch, especially your shoulders and neck. Sports and athletic activities are not only good for your health, they reinvigorate your mind, promote good eating habits, fill your lungs with air and even increase your metabolism. But what happens when we practice bad technique? Whether it’s doing crunches in the gym, riding your bike, lifting weights or swimming lap after lap, there is always a possibility of straining the neck or working one side while not working the other. Focus on balanced and rhythmic movements without straining. Never jerk your neck, or overextend. Your best bet is to learn proper technique before bad form embeds in your muscle memory. Remember, neck pain can travel to your shoulders, spine and beyond. Doing anything right and sustaining it will keep you strong and pain free. Few things are better for the body than a good night’s sleep. But nagging neck pain can ruin that, and can last for days. Oftentimes the problem has to do with how we prep for rest. Whether you steal a catnap on a plane or are down for the count in your bed, be sure to prep for sleep properly. Start with ensuring you are not putting excessive stress on your neck. If you nap on long car rides or plane trips, bring a travel pillow to keep the neck from slumping over. When sleeping in a chair, try to bring the chair to a reclining – not upright – position. When in a bed, make sure your head is even with your shoulders and not propped up too high or low, thereby straining the neck. Consider using orthopedic pillows that keep your head comfortably set for the night. Yes, tech neck is a real thing. And believe it or not, it has doctors very concerned. Tech neck, the practice of looking down at your mobile device, actually puts strain on your neck and, after hours of checking social media, streaming online, and checking your emails, can result in serious damage to the neck and spine. When looking at your smart device, try to keep it at eye level, not below, which can strain your neck. Try tilting your head against a chair or a wall and raising your smart device up to your eyes. It may look and feel awkward at first, but it will benefit your neck. A doctor’s visit should not be saved for when you feel awful or once a year for annual check-ups. Don’t put off the pain you are starting to feel in your neck until it becomes so pervasive you are miserable. Your doctor can diagnose your condition and recommend a treatment plan to reduce your pain. If your habits have become a pain in the neck, it’s time contact the experts at Spectrum Orthopedics. With state-of-the art MRI technology and an advanced surgical center, our facility houses everything necessary for complete care. For more information about neck pain, disc degeneration and repair, or to schedule an appointment, call (330) 305-0838 or (844) 469-2663 or fill out our online appointment request form today.